It is the largest of our rooms, cozy and bright with two large windows overlooking north-west. It has a comfortable double bed and two singles, with the possibility of adding an extra bed. Led tv and wi-fi included. 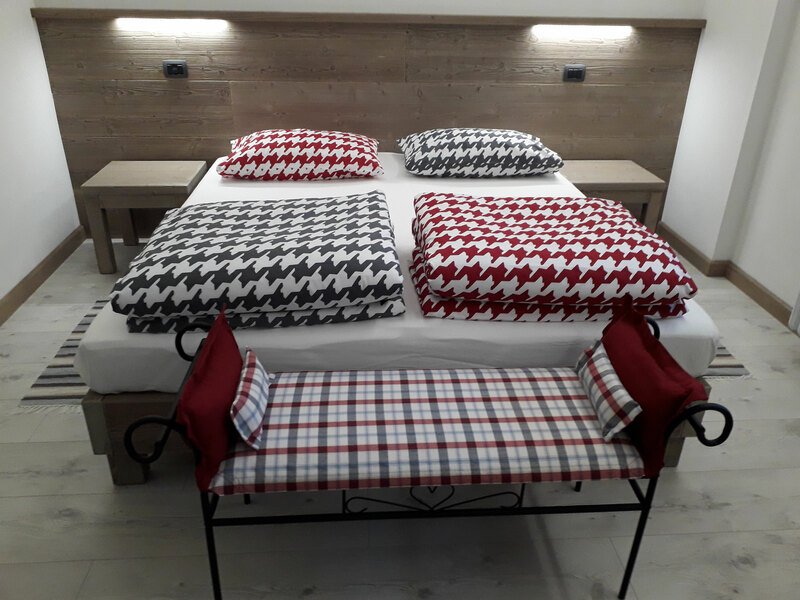 The simple and functional furniture, handmade by a local artisan, takes up warm colors and the veining of the wooden wall paneling that serves as a headboard and the closet including a comfortable shoe storage and a luggage space. The large en suite bathroom, with window, is equipped with a spacious shower. Hair dryer, towels and soap included. It is a great and comfortable room, very bright with the two large windows overlooking north. It has a comfortable double bed and a single, with the possibility of adding an extra bed. Led tv and wi-fi included. The simple and functional furniture, handmade by a local artisan, takes up the soft color and the streaks of the wooden wall paneling that serves as the headboard and closet including a convenient shoe storage and a luggage space. The en suite bathroom, with window, is equipped with a spacious shower. Hair dryer, towels and hand soap included. It is the smallest of our rooms, for a couple, intimate, cozy and very bright with a large window facing to the south east. It has a comfortable double bed or two single beds. Led tv and wi-fi included. The simple and functional furniture, handmade by a local artisan, takes up the pale colours and the streaks of the wooden wall paneling that serves as the headboard and closet included a convenient shoe storage and a luggage space. The en suite bathroom, with window, is equipped with a spacious shower. Hair dryer, towels and soap included. The room price is per night including bed and breakfast. We do not accept payments by credit or debit card. Children under 6 years old: 1 children free without extra beds. Eventual extra bed € 15.00/day. Check-in from 4.00pm to 7.00pm. Check-out by 10.30am. We kindly ask our guests to inform us, at booking time, on their estimated arrival time.